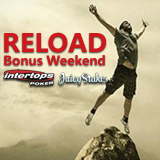 Intertops Poker and Juicy Stakes Poker will double your deposit to your poker account this weekend. A 100% up to $100 September Reload Bonus is available at both poker rooms until this Sunday, September 3, 2017. Details are available at Intertops Poker (https://poker.intertops.eu/en/promo/27-reload-bonus) and at Juicy Stakes (https://www.juicystakes.eu/promotions/reload-bonus). Online poker bonus available until September 3, 2017 only. Intertops Poker and Juicy Stakes are the most popular online poker rooms on the Horizon Poker Network and welcome players from all over the world. Each hosts Texas Hold’em and Omaha ring games of all stakes and levels as well as poker tournaments where players can win big prizes for just a small entry fee. Currently, they’re both hosting an online satellite tournament series that will send the winner to play in the WSOPC in St. Maarten this fall. In addition to online poker, both casinos also have a wide selection of slots and table games from Lucktap, Worldmatch and Betsoft.